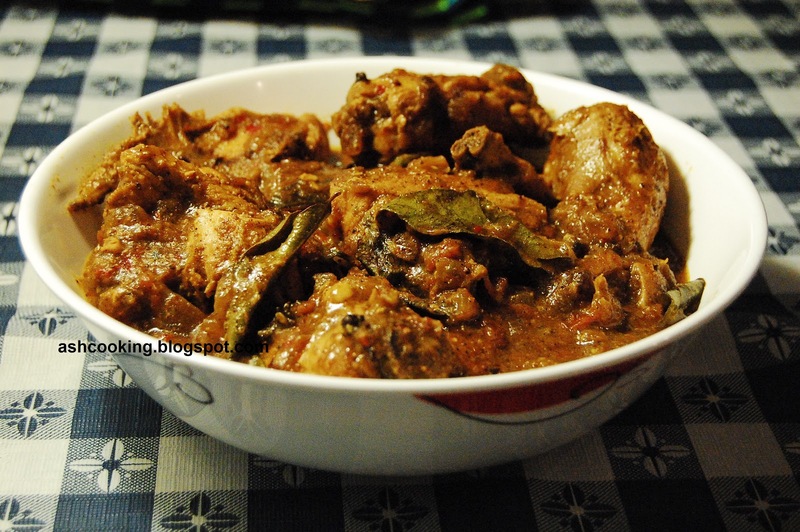 Chettinad is a small region in Tamilnadu located in Southern India. 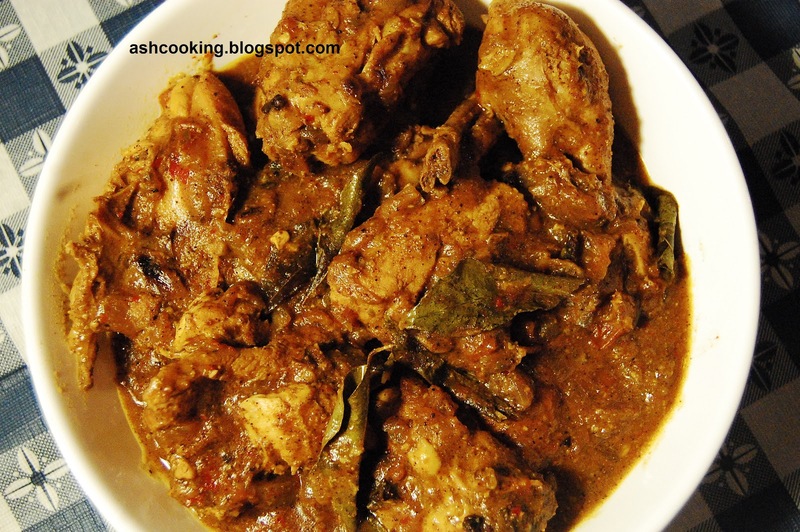 The cuisines that derived from Chettinad burst with a distinct flavour of curry leaves and an assortment of spices and are fast getting popular all across India for their aroma and intense piquancy. Chettinad cuisines comprised of non-vegetarian delicacies are mainly accompanied by rice or rice based preparations such as uttampam or dosa. Chettinad cuisines also have a myriad of vegetarian delicacies to its name with idiyappam, paniyaram, vellai paniyaram, karuppatti paniyaram to name a few. 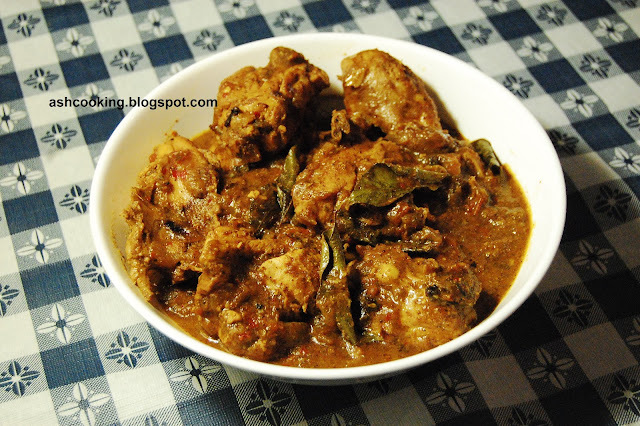 Of all the meat preparations belonging to Chettinad cuisines, Chicken Chettinad or Chettinad Chicken is listed as the most flavourful. It was a staple order we placed while dining in a Chettinad restaurant during our Bangalore days. I have adapted the recipe described below from a cookery show hosted by Aditya Bal. If you are regular in my blog, you must know by now that I am an ardent fan of Aditya and when I stayed in India, I never gave his shows a miss. But upon coming to US, unfortunately I am unable to keep track on all the episodes featured in his program. This is one of the many downsides of living away from your own country....you miss all your favourites shows and movies. There are avenues, however, of capturing the missing programs via You Tube or via a battery of websites that telecast the old episodes of television shows and pirate copies of recent Bollywood flicks but the experience is nowhere near to seeing the original. It is like 'dudher swad ghol e metano' (quenching the thirst of milk with buttermilk). 1) Grind the masala paste together into fine paste. 2) Heat oil in a wok. When oil turns hot, add curry leaves. Add onion and shallow fry till translucent in color. 3) Add cloves, cinnamon stick, masala paste, turmeric powder and tomato with a sprinkling of water. Sauté till tomatoes soften. 4) Add the chicken and combine it well with the masala. Add some more water and cook covered till the gravy thickens and the chicken is cooked through. 5) Finally add ghee before turning off the heat.